NETWORK FINALS: SUNDAY NIGHT FOOTBALL adjusted to 8.7 in final numbers. In addition, after adjustment for the football overrun, THE SIMPSONS, SON OF ZORN and THE LAST MAN ON EARTH lost 0.1. 60 MINUTES also lost 0.1. CABLE HIGHLIGHTS: AMC’s THE WALKING DEAD is still the biggest scripted hit on television, but it’s not the powerhouse it used to be. The midseason finale, while up 0.12 from last week to 5.09, was down a giant 1.93 from the 2015 midseason finale (which was itself down 0.56 from 2014)–obviously a high-class problem to have, but one can imagine the concern getting a bit deeper a year or two from now. 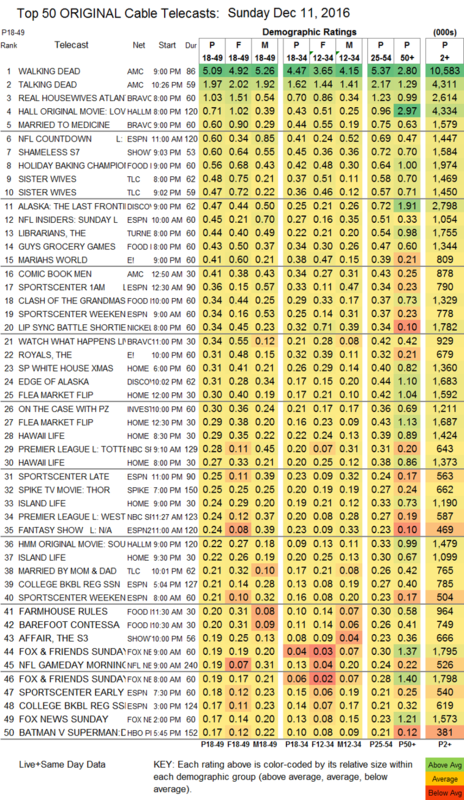 TALKING DEAD had a 0.28 bump to 1.97, and COMIC BOOK MEN was up 0.12 to 0.41. Hallmark had another big holiday movie with 0.71 for LOVE YOU LIKE CHRISTMAS. We now know why Showtime hasn’t renewed SHAMELESS yet (an uninformed but experienced guess would be that officially, Emmy Rossum will accept parity with William H. Macy, but there will quietly be another part of her deal like a development fee that will put her over the top), which dipped 0.02 to 0.60, while THE AFFAIR rose 0.02 to 0.19. The season finale of HBO’s DIVORCE fell 0.04 without a WESTWORLD lead-in to 0.17. Starz’s season finale of ASH VS. EVIL DEAD was steady at 0.14, and the season (?) finale of BLUNT TALK held at 0.02/77K. TNT’s THE LIBARIANS fell 0.05 to 0.44. 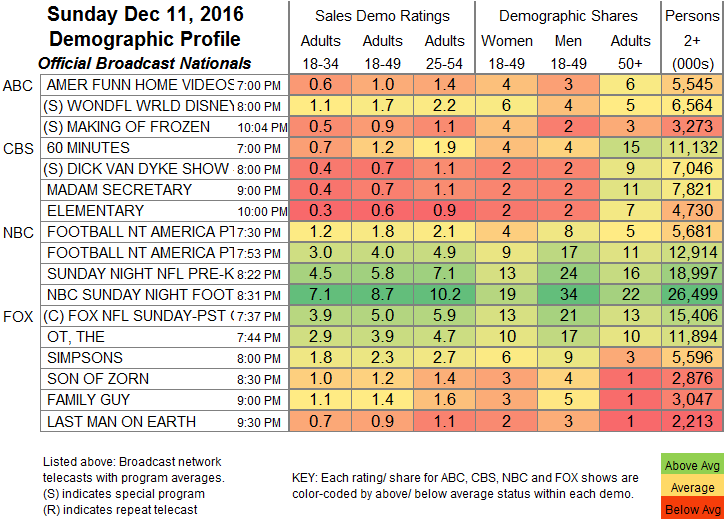 On E!, after MARIAH’S WORLD gained 0.13 to 0.41, THE ROYALS was up 0.05 to 0.31. USA’s EYEWITNESS lost 0.03 to 0.15.